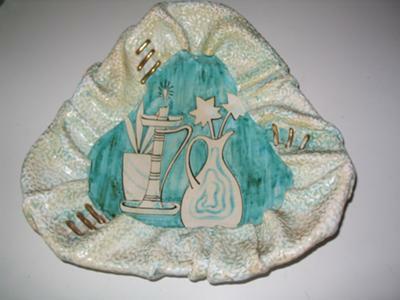 This Pottery Wall Plaque marked BAS Deruta Italy belongs to a client of mine. I am a ceramic conservator, and although the wall plaque is in perfect condition albeit a llitle dusty. I cannot find any reference to it. 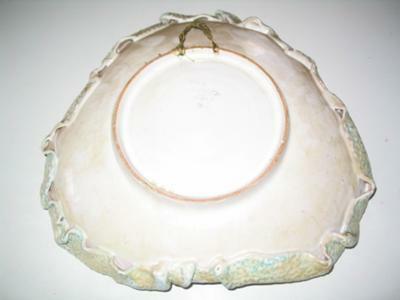 It is a three cornered wall plate with folded edges, tied with gilded laces. The edges have a raised design and the centre is painted in a aquamarine colour on a cream base. The illustration is in cream, outlined in black (a with a vase or ewer with flower stems and a candle holder and candle with a lit flame and a potted plant). 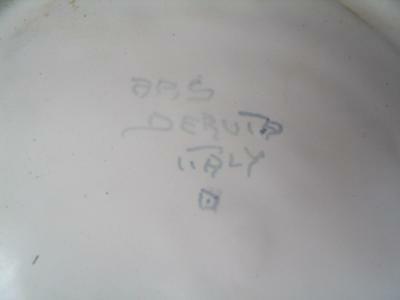 The marks on the back are BAS Deruta Italy and a diamond with a dot in the centre. There is a rumour it came from a museum in North Africa (I am in South Africa – the owner says it is from a place called Dekka). Although I cannot verify this. I can find reference to Deruta Pottery in Italy (maiolica) but none of the images I have seen show anything quite like this. If anyone can help identify it I would be most grateful.